Breathe in and smell the opportunities! The kids are back to being productive, schedules are starting again and you get to have peace of mind. What a beautiful time of year! However, it can also be a stressful time with all the running around, nonstop planning and re-planning. It's all about perspective, right? 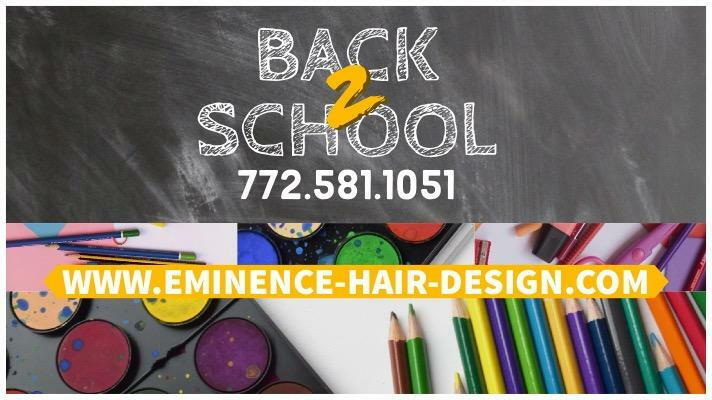 August 13 is the first day of school in Indian River County and we at Eminence Hair Design want you to hold on to summer for as long as you can. Balayage, the French word for "sunkissed," is the perfect solution to keeping your summer hair glow on point. This summer we have had and will continue to have hands-on classes for this absolutely amazing highlighting technique. It will transform your experience and keep you looking like the natural, sunkissed bombshell you always wanted to be. While we are always having continued education for our staff, we want you to get your learning on, too! For the whole month of August, get a FREE gift when you book your hands-on Make Up lesson. What a perfect opportunity for you while you have some "me time." Let our skilled make up artists give you all the tips and tricks for YOUR makeup. Lots of things to look forward to this August. We can't wait to be a part of it and see you and the kids grow into new, improved and beautiful versions of yourselves.